The luna moth (Actias luna) is an impressive moth of pastel green and long sweeping tails with a wingspan of five inches and large combed antennae. Small eye spots are located on the forewings and larger eye spots can be found in the center of the hindwings. 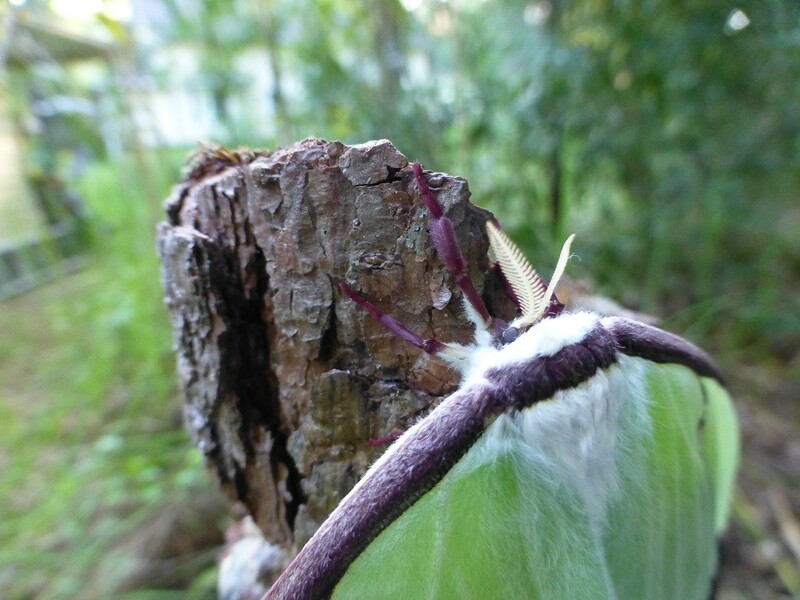 Adults that emerge from within their cocoons in the spring have pink-purple wing margins, while those emerging in summer have yellow wing margins. 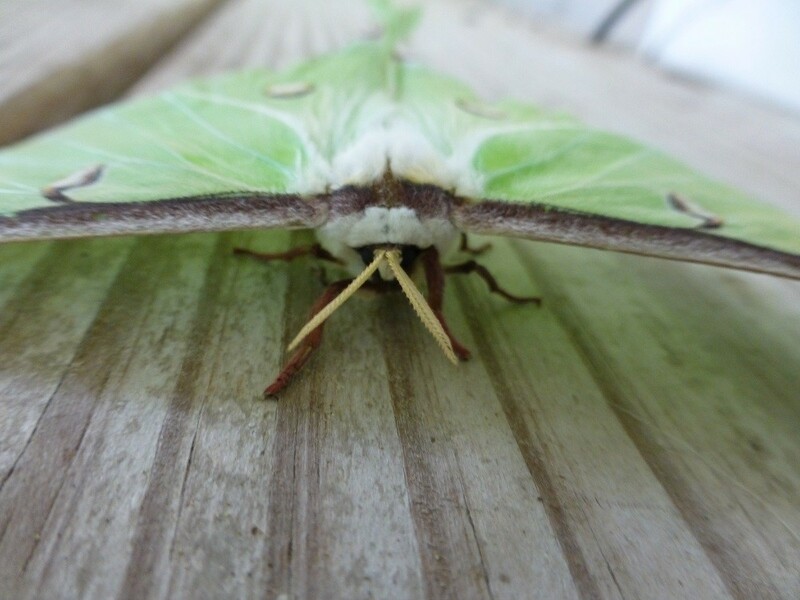 Luna moths are members of the giant silk moth family (Saturniidae), distinguished by their silk cocoon construction, which includes our largest moths such as the imperial, cecropia, polyphemus and promethea moths. 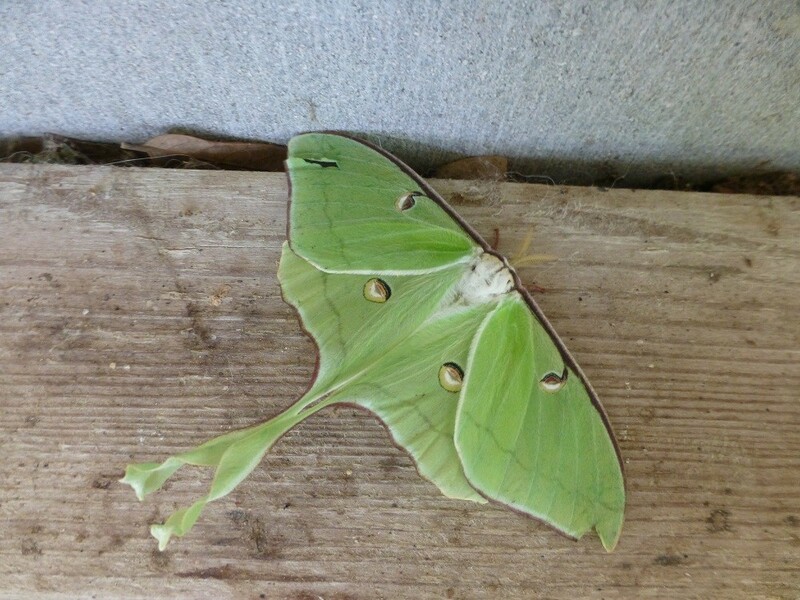 Luna moths are found in deciduous hammocks in late spring and summer. Adults emerging from their cocoons can be located on the ground in the early morning, and recently emerged adults can be found on the lower portions of trees drying their wings for flight. Flying adults can often be seen around lights in the evening. 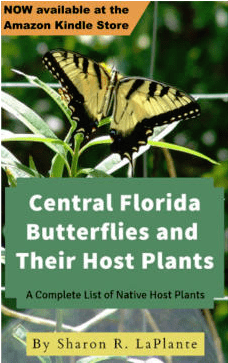 They range from southern Canada throughout the eastern United States and in our state from central Florida northward. Adult silk moths fly at night in search of mates and host plants on which to lay their eggs. Adults only live long enough to mate and lay eggs, which is generally only three days, and then they perish. Females attract mates by releasing a chemical pheromone that the males can detect from up to a mile away. Unlike an adult butterfly, the adult silk moth does not eat and has no mouth parts, but is sustained throughout its short life by the energy stored within its large soft body. 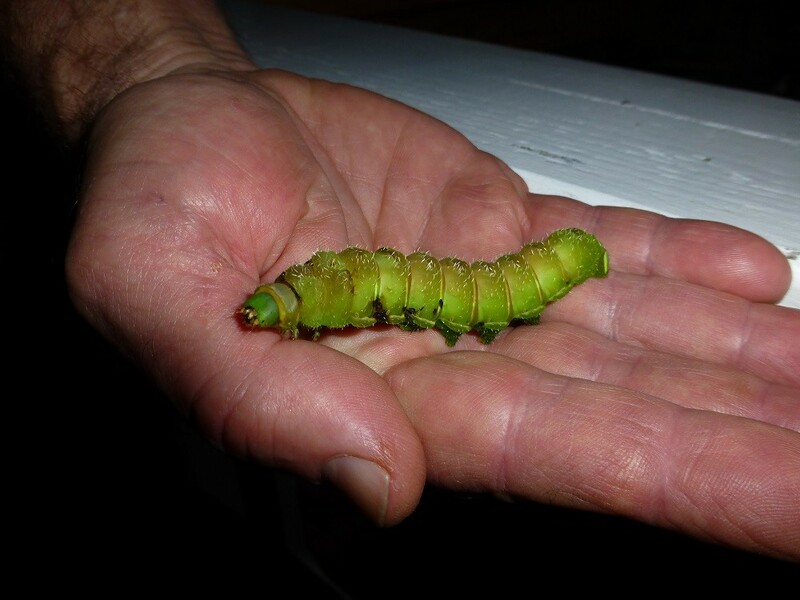 Luna moth larvae prefer to feed on hickory trees but can be found on other trees in our area such as willow, maple, sweet gum, persimmon, and beech. The caterpillar is very large with green coloration and a thin lateral yellow stripe. Its surface is smooth except for small reddish orange knobs called tubercles and occasional small hairs. The head may be green or brown in color. Silk moth larvae go through instars as do butterflies and following their last instar (their fifth) they spin an egg shaped cocoon made up of silk with leaves of the host plant which are attached at random. In the fall when the host plant drops its leaves the cocoon also drops to the ground. Metamorphosis is generally complete within a matter of weeks unless the cocoon was constructed late in the season where it will then over-winter and the adult moth will emerge in the spring. Florida’s climate supports as many as four broods per year.